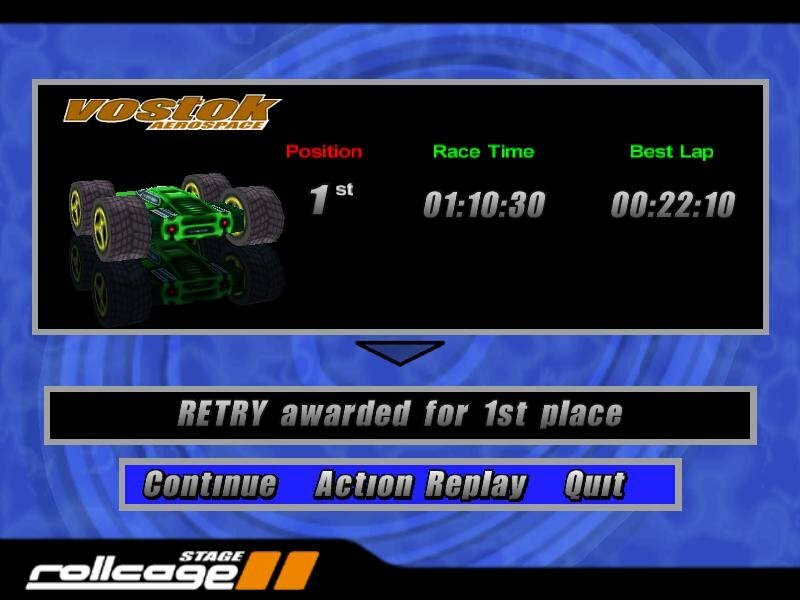 Same engine with a minor tune-up. 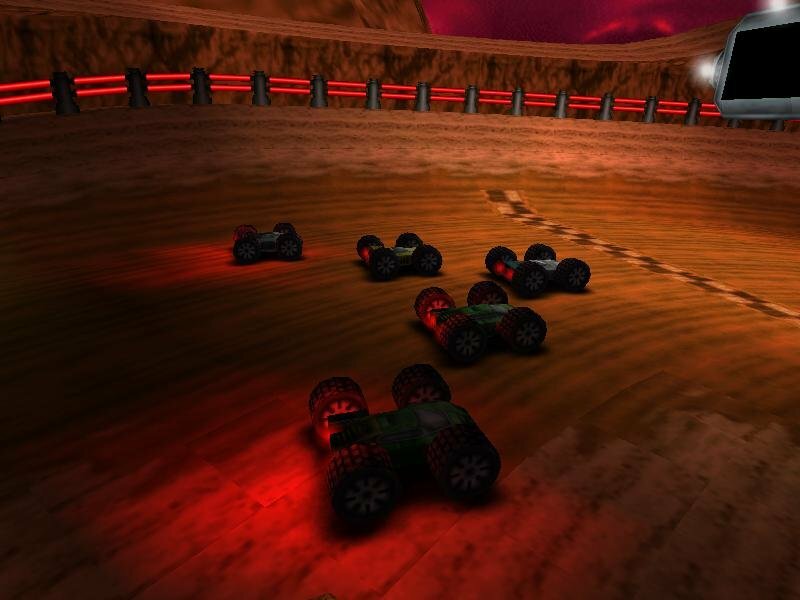 Rollcage is a combat, demolition derby-style racing game featuring high G-force physics, lots of smashing and bashing, great speeds, several indestructible vehicles, and an arsenal of weapons. 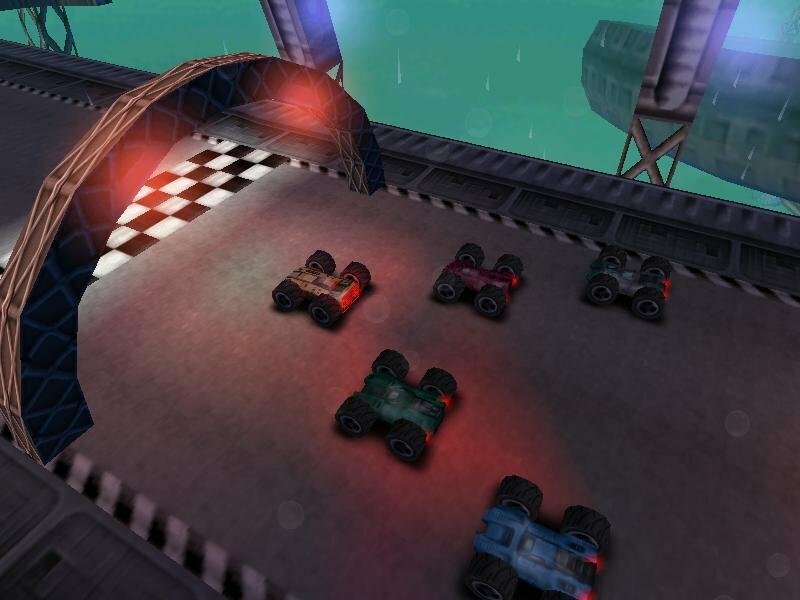 The vehicle roster has been increased to some 20 cars, all capable of making death-defying flips, drops, and crashes. 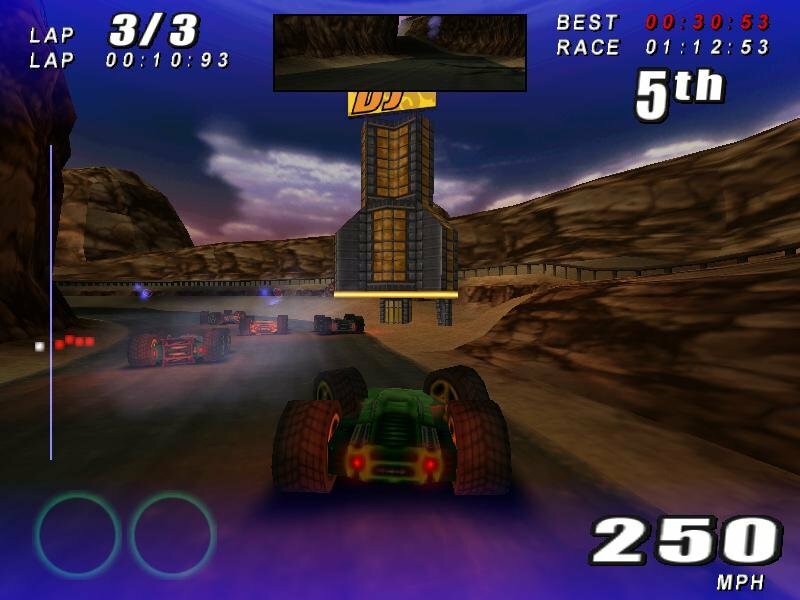 While driving any of these models, players can pick up high-powered weaponry to blast structures and objects in the game world. 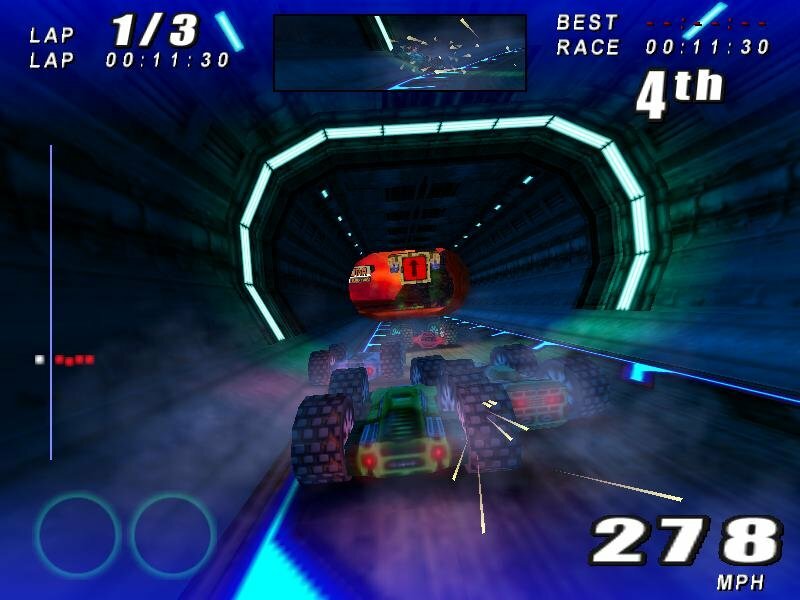 For instance, a player might blast a building support up ahead and send several tons of concrete down on a rival. 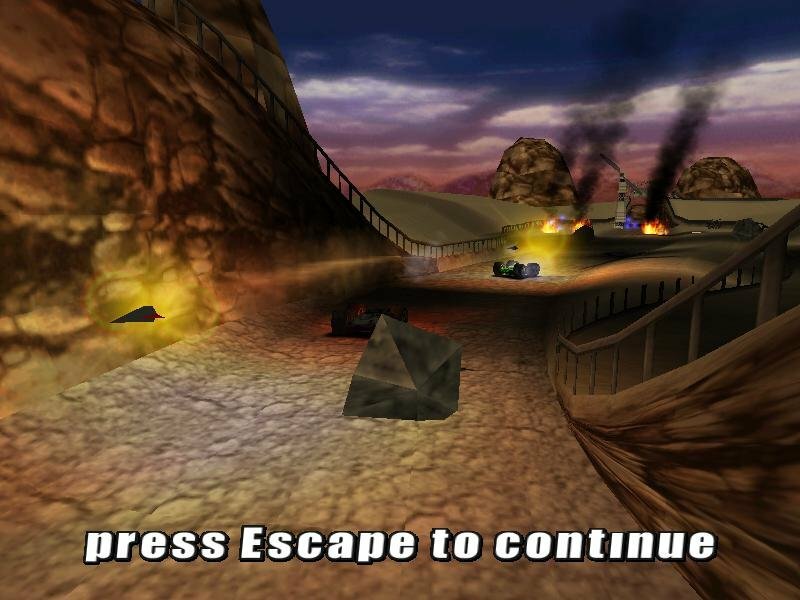 If that’s not interesting enough players can also use the vehicle itself as a weapon, smashing into scenery causing it to explode, leaving buildings tumbling in its wake, and causing various acts of mayhem. 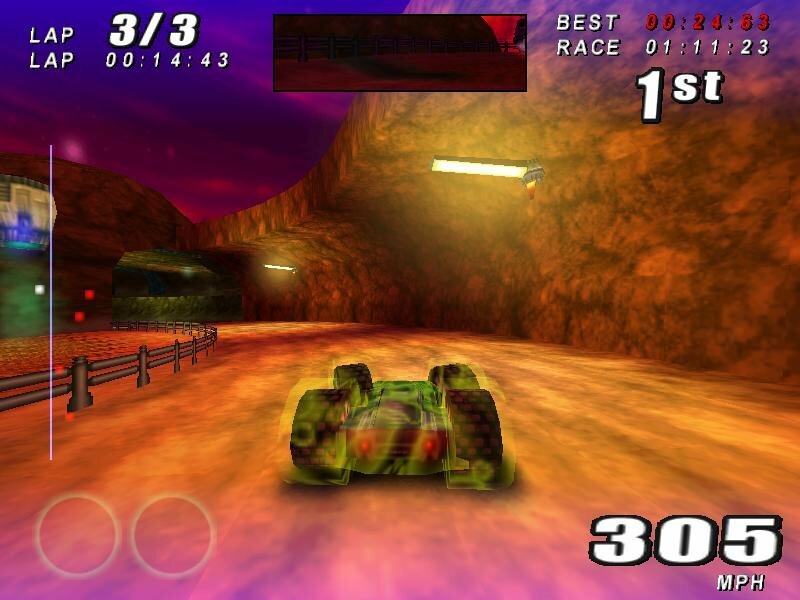 Few games are as fast as Rollcage. 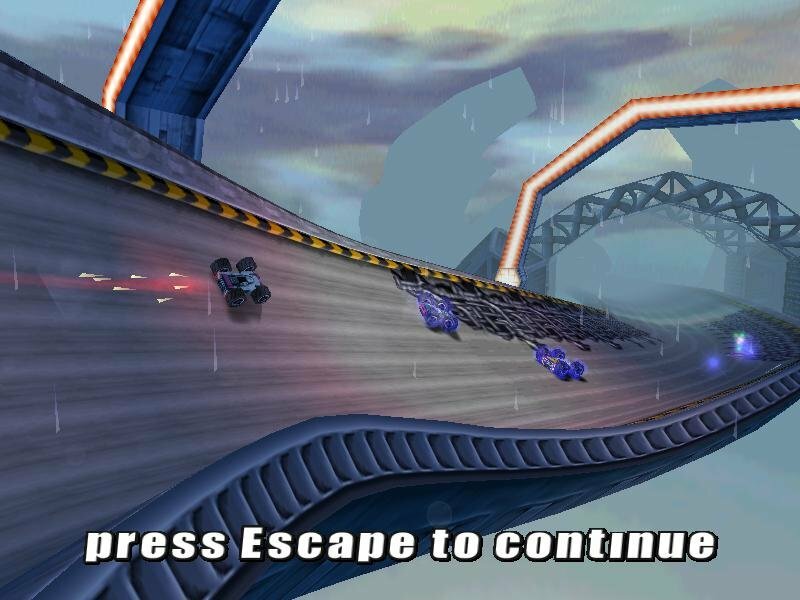 As was the case with the original you are completely free to defy basic physics by driving on and off walls and ceilings. 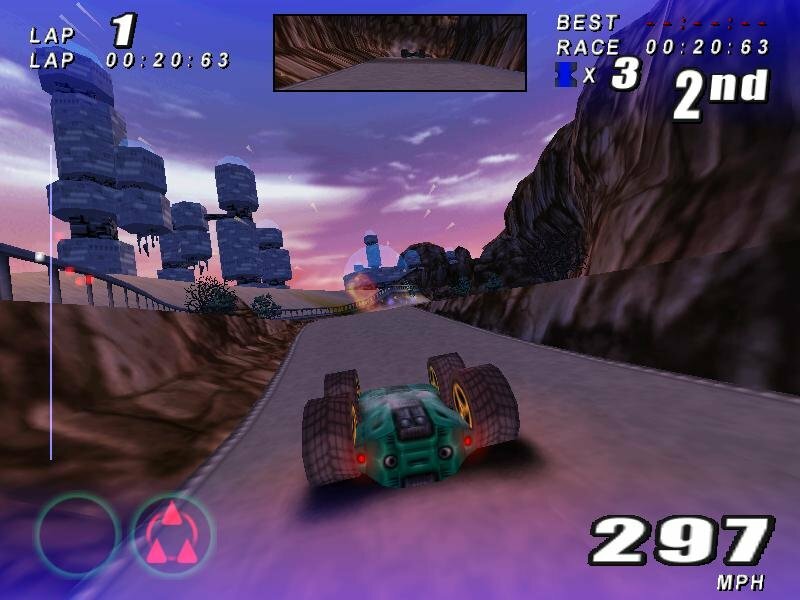 Although the camera isn’t as unfriendly as before, it’s still remarkably disorienting when you tear along the sides of a wall and crash into something solid. 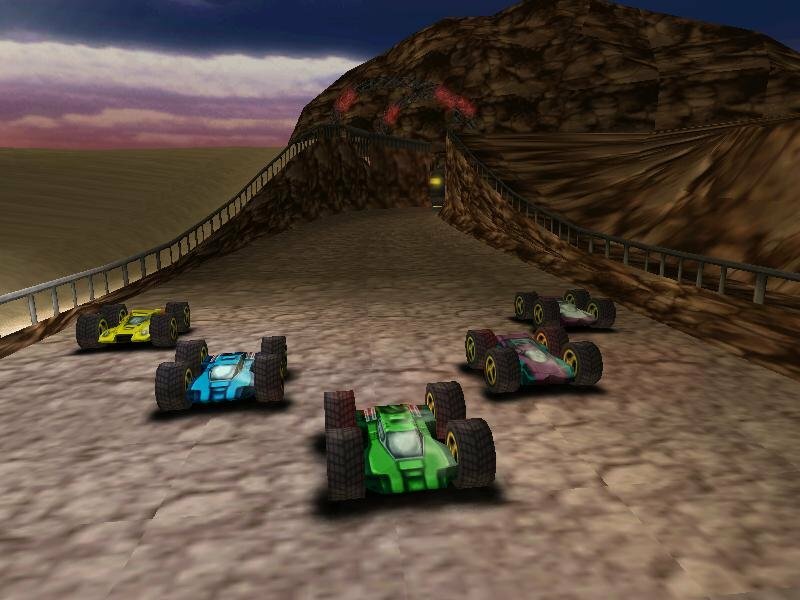 It’s hard to tell your facing (each car looks about the same from any angle), and this creates a great many problems when trying to recover from a crash. 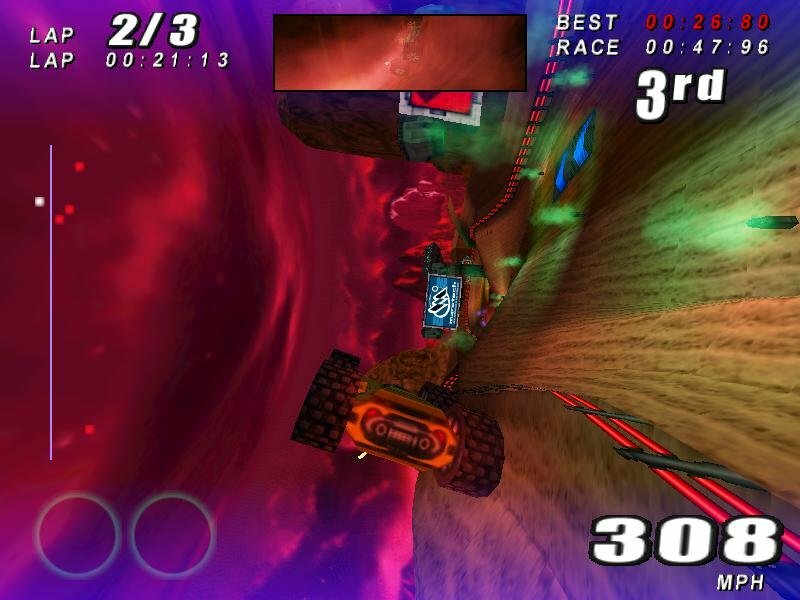 It helps that the cars are two-sided, so you can fall on your head and continue on your merry way, but overall the wall-driving aspect tends to get in the way (it’s usually safer to stick to the road). 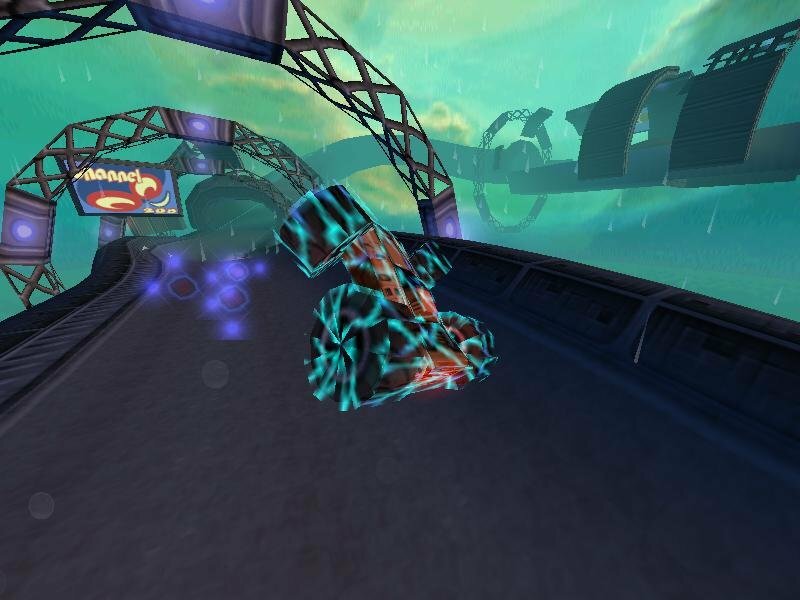 A good deal of tracks and activities have been included but the game resorts to that oh-so-annoying practice of locking out most of the content on startup, leaving you to go through the solo championship gradually accessing each track and car. 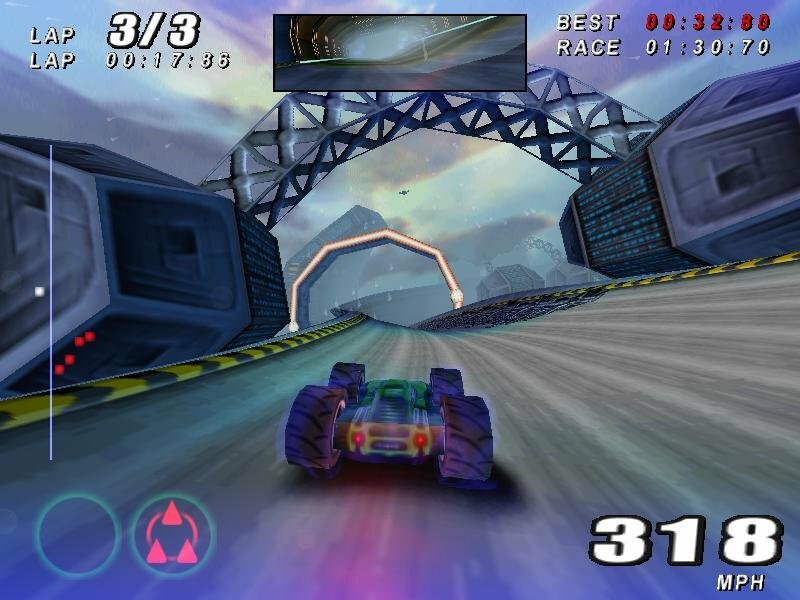 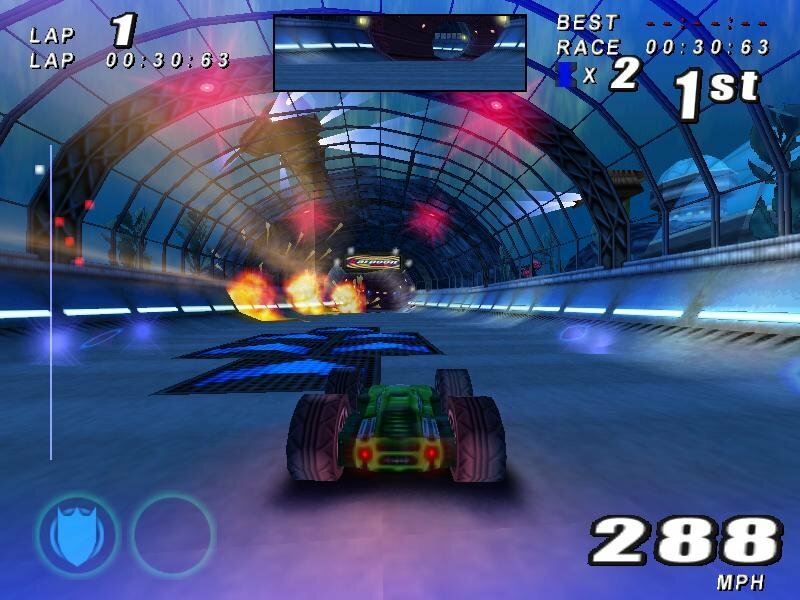 Otherwise the gameplay is largely the same, comprised of super-fast driving through gorgeous, flashy and extremely colorful tracks. 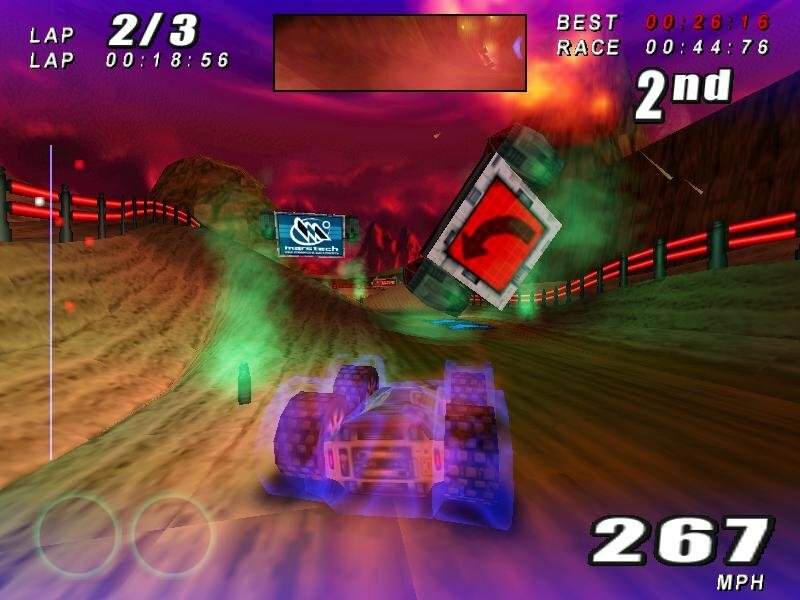 While the palette of colors and track themes are impressively diverse, the tracks themselves have been noticeably shortened compared to the original. 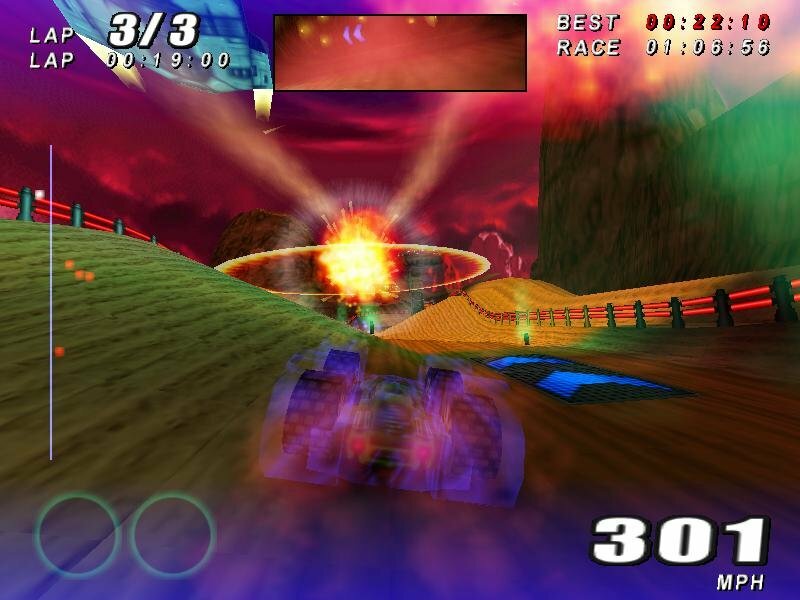 We get an impressive collection of power-ups as before, both offensive and defensive, that ranges from speed boosters to shields to highly entertaining homing rockets. 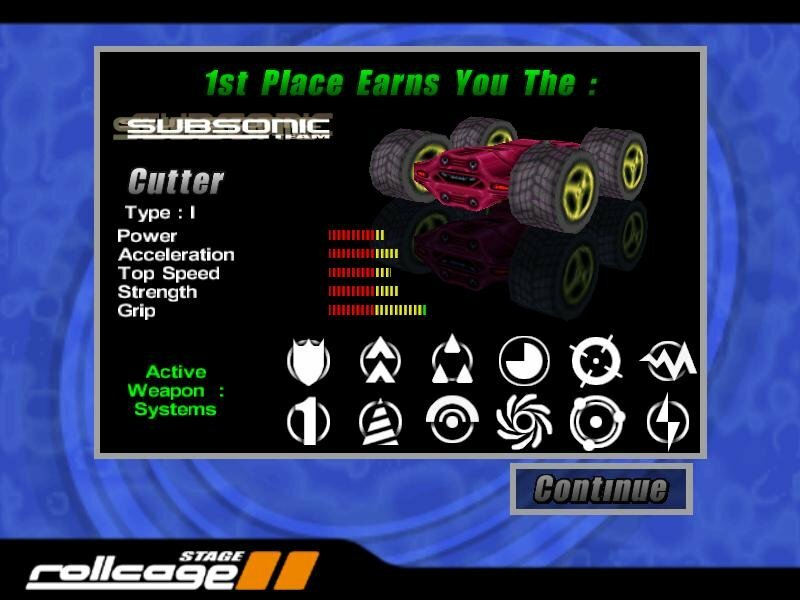 Overall Rollcage Stage II looks and plays just like its predecessor, and could have easily been branded an expansion pack to some degree. 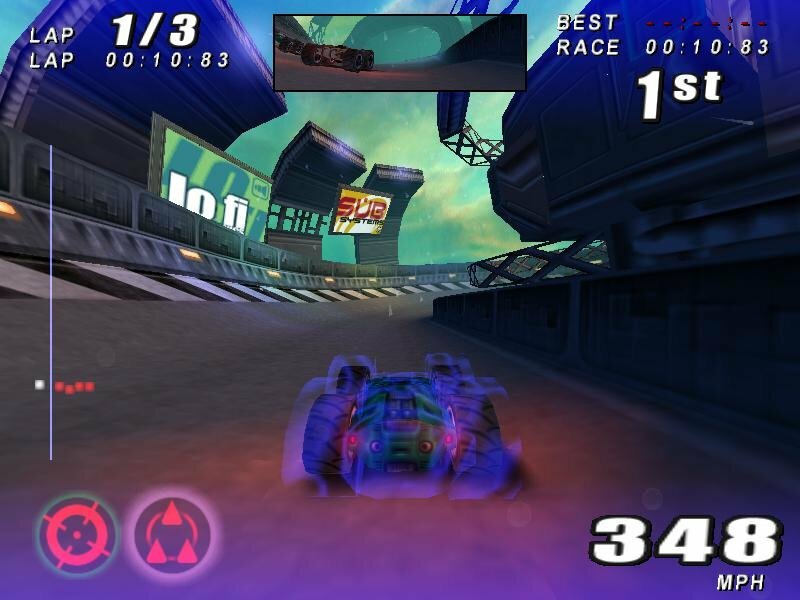 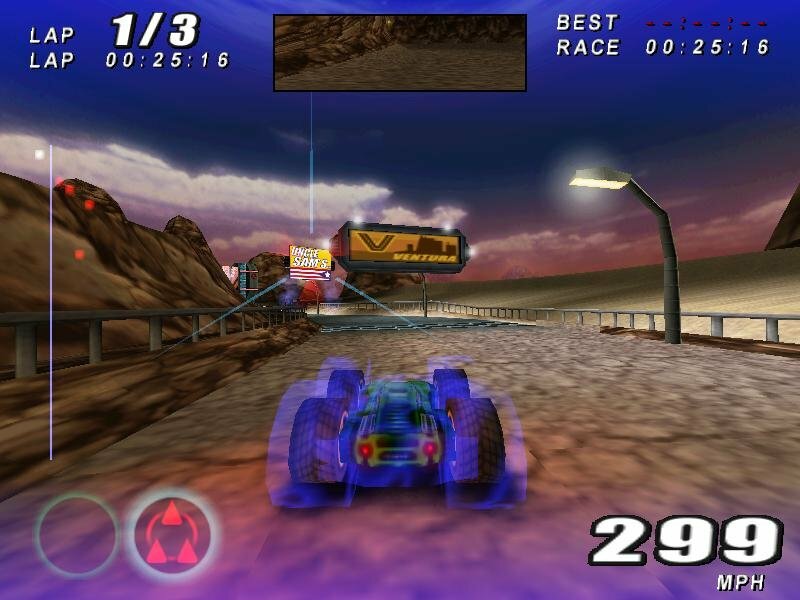 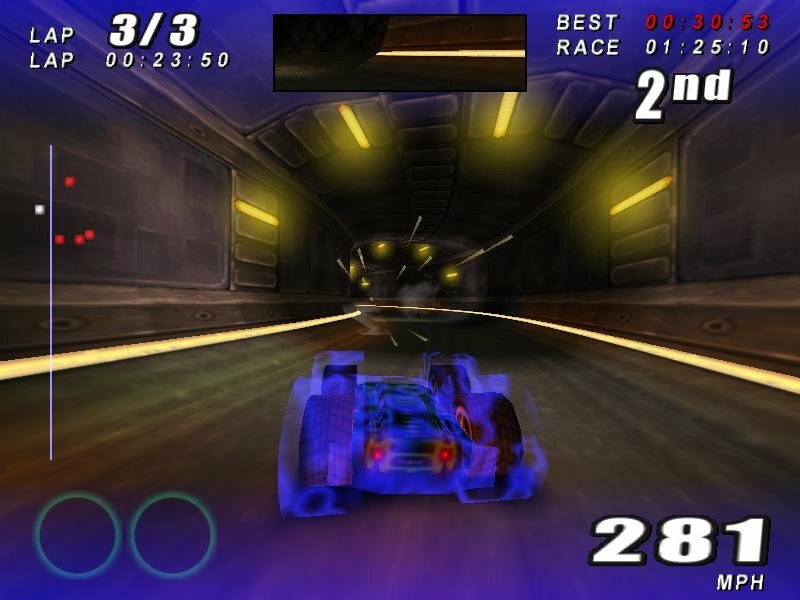 A few of the problems from the first game have been passed on unfortunately, yet at the same time it retains the same form of gratuitous, action-oriented racing as well.